South Korea’s KB Kookmin Bank and Shinhan Bank held key meetings to review and recognize last year’s business performance and set fresh operational strategies for 2019, as the country’s two largest banking groups step up their competition to clinch this year’s “leading bank” title. Over the weekend, KB Kookmin Bank held a strategy meeting that brought together the bank’s CEO Hur Yin and the deputy directors at the bank’s nationwide branches to discuss the bank’s performance last year and to set this year’s operational strategy direction. Though held annually, the event this year comes at a time of instability caused by an ongoing pay dispute between KB’s management and labor union. The two sides are still at an impasse in negotiating the terms of the bank’s wage-peak and pay-band system. The bank’s labor union staged a nationwide strike -- the first in 19 years -- earlier this month. And if negotiations fall through again, the union plans to hold another strike from Jan. 30 to Feb. 1, shortly before the Lunar New Year holiday. The prolonged labor-management dispute has led to concerns over business stability while also drawing public criticism for inconveniencing bank customers. Given the current situation, KB Kookmin Bank’s latest strategy meeting is being widely perceived as a venue for the company’s leadership to regroup and to dispel a pervasive sense of instability. While KB seeks internal stabilization, Shinhan Bank, currently trailing behind KB in terms of both assets and total operating profit, also took the opportunity to motivate and regroup its employees with an annual performance evaluation and awards ceremony on Saturday. The annual event aims to reward and incentivize the bank’s outstanding regional offices and employees for their performance and contribution to the bank’s growth in the past year. The rewards handed out this year included promotions and career development opportunities, Shinhan said. Looking ahead, Shinhan Bank will seek to build upon last year’s performance – in which it recorded its highest-ever operating profit, securing the top title in customer satisfaction among Korea’s commercial banks -- to seek further growth this year, said CEO Wi Sung-ho. “If we continue to break out of our old ways and seek new approaches, we can arrive at the future of finance that we seek. This is the time to seek a major transformation in every area of banking,” Shinhan Bank CEO Wi Sung-ho said in his keynote address during the event. 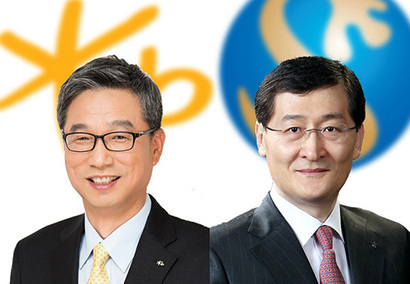 In 2019, KB and Shinhan are expected to engage in a fierce battle to become Korea’s biggest banking group, with KB trying to defend its title from Shinhan. As of the third quarter of 2018, KB had earned 2.87 trillion won ($2.55 billion) in cumulative net profit, higher than the nation’s No. 2 player, Shinhan Financial Group, which saw cumulative net profit of 2.64 trillion won during the period. Though last year’s fourth-quarter earnings have yet to be released, industry analysts predict KB has defended its leading position in 2018. However, Shinhan might be able to overtake KB in terms of net profit once it completes the acquisition of Orange Life, formerly known as ING Life. Last week, the Financial Services Commission approved Shinhan’s deal to buy a 59.15 percent stake in Orange Life from a special purpose company held by private equity fund MBK Partners for 2.3 trillion won. With the acquisition, Shinhan Financial Holdings’ total assets as of the third quarter of last year rose to 490 trillion won, overtaking KB Financial Holdings’ assets valued at 478 trillion won.